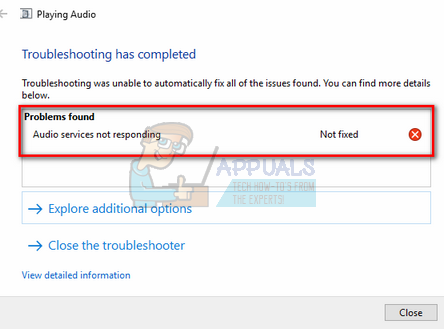 The error “Audio services not responding” is an error message generated through Windows sound troubleshooter which is usually run when you are experiencing problems with your sound devices. This error usually means that your sound device is in an unresponsive where it isn’t responding to your computer’s commands or messages. This is a very common error and usually occurs when you upgrade your version of windows using Windows Update. There are a few workarounds which include making sure that all the audio services are running as expected and the drivers are updated to the latest build. If all the solutions don’t work, we have to resort to a system restore. Before we resort to more complex and extensive solutions, we will try restarting the audio service. Alongside your sound hardware and drivers, there is an audio service present which is responsible for managing the audio on your computer. A simple restart might reboot its configurations and solve the issue at hand. Press Windows + R, type “services.msc”, and press Enter. Once in services, navigate through all the entries until you find “Windows Audio”. Right-click on it and select “Restart”. Now right-click the entry again and select “Properties”. Set the startup type as “Automatic”. Press Apply to save changes and exit. 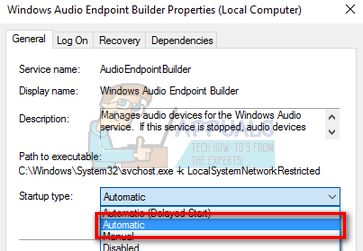 Go back to services and look for “Windows Audio Endpoint Builder”. Right-click it and select “Restart”. If it isn’t started yet, click on “Start”. After starting the process, open its properties and select the startup type as “Automatic”. Press Apply to save changes and exit. Restart your computer and check if the problem still persists. Before moving on to more technical workarounds, we will make sure that all the audio components are running. If any of them isn’t, it may be the cause why you are getting the error message. Also temporarily disable your antivirus as they sometimes block some services due to which you face difficulties. These are services and exclusion of any of them can cause discrepancies. Press Windows + R, type “services.msc” and press Enter. Now make sure that the following services are in the running state. If they are not, right-click on them and click “Start”. Also, make sure that all these services are set to start as “Automatic”. After starting the processes (if they were off), check if the problem at hand got solved. If it didn’t, consider restarting your PC and check again. If both the above solutions don’t make any difference or the checks were already correct on your machine, we can try executing some elevated command prompt instructions on your command prompt. Do note that you will need an administrator account to carry out this operation. Press Windows + S, type “command prompt”, right-click on the application and select “Run as administrator”. Once in elevated command prompt, type the following command and press Enter. Now type the following command and press Enter. After both the instructions are executed, type “exit” and press Enter. Now restart your computer and check if the problem at hand got solved. As your operating system keeps upgrading over time, the sound drivers are also included in most of the package and they also get updated periodically. Your computer has basic default driver already saved so whenever you uninstall your current drivers, your computer recognizes the hardware connected and installs the driver accordingly. We can try installing the default drivers on your system. Select the option of “No (your device might not work as expected)”. Press Save changes and exit. 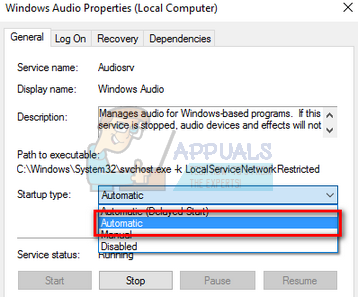 This will disable the Windows update from updating your audio drivers automatically. Note: If this solution doesn’t work, make sure to change the option back to “Yes”. Once in the Device manager, expand “Sound, video and game controllers” category. Right-click on your sound device and select “Uninstall device”. Check the uninstall driver checkbox to uninstall the driver as well and proceed with the uninstallation. 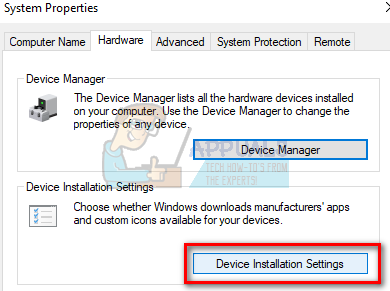 Once the device is uninstalled, right click on any empty space on the Device manager and select “Scan for hardware changes”. Your computer will now detect the audio hardware on your computer and automatically install the default drivers present on your computer. Now check if this brings any difference. Also, reboot your machine after the installation of default drivers. 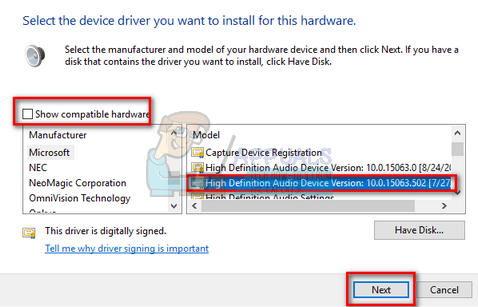 Many users reported that installing High Definition Audio Device driver instead of IDT High Definition Audio CODEC etc. solved the problem for them. We can try this last solution before we resort to a system restore or doing a clean installation. Once in the Device manager, expand “Sound, video and game controllers” category. Right-click on your sound device and select “Update Driver”. 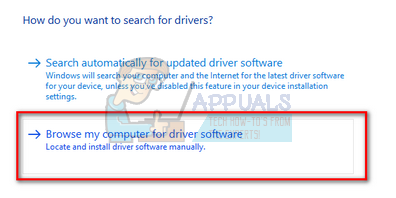 Now an option will come forth whether to install the drivers automatically or manually. Select “Browse my computer for driver software”. 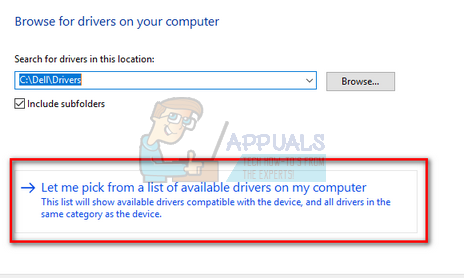 Now select “Let me pick from a list of available drivers on my computer”. Uncheck the option “show compatible hardware” to ensure that all the results are listed in your drivers list. Navigate through all the drivers until you find “High Definition Audio Device”. Select it and press Next. Follow the on-screen instructions to complete the installation. Restart your computer and check if the problem is solved. Note: If this doesn’t work, try downloading the drivers from your manufacturer’s website and install them using the method listed above. In most cases, this also solved the problem. If all the above methods don’t work, we are left with no choice but to restore Windows to the last restore point. If you don’t have a restore point, you can install a clean version of Windows. You can use the utility “Belarc” to get all your licenses saved, backup your data using external storage and then perform a clean install. 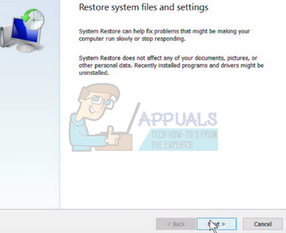 Here is the method on how to restore Windows from the last restore point. Press Windows + S to launch the start menu’s search bar. Type “restore” in the dialogue box and select the first program which comes in the result. 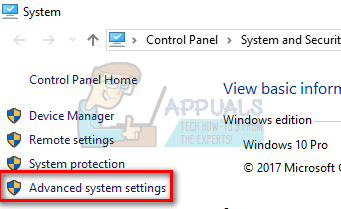 One in the restore settings, press System Restore present at the beginning of the window under the tab of System Protection. Now a wizard will open navigating you through all the steps to restore your system. Press Next and proceed with all the further instructions. Now select the restore point from the list of options available. If you have more than one system restore points, they will be listed here. Now windows will confirm your actions for the last time before it starts the system restore process. Save all your work and backup important files just in case and proceed with the process. Once you have restored successfully, log into the system and check if the error at hand got fixed. If you don’t have any restore points, you can do a clean install of Windows using bootable media. You check our article on how to create a bootable media. There are two ways: by using media creation tool by Microsoft and by using Rufus.